Cover-to-cover examples of gourd instruments from around the world, many with step-by-step photographs and descriptions for making many of them yourself. Photographs include hundreds of traditional, ethnic and contemporary instruments as well as many beautiful photographs of instruments being played in their traditional setting. This is the book for anyone who has ever wanted to make a musical instrument but was intimidated by the woodworking skills or tools required to make them. We've made all of these instruments - rattles, drums, flutes, horns, fiddles, musical bows, rasps, guitars, and more - with just very simple household tools and items from the junk pile and garage. We guarantee that the hardest thing to find for any of our projects will be the gourd - and you know where to find those! An ideal book for any classroom teacher. Throw away the cigar boxes and rubber bands. 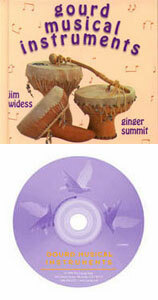 Teach the kids how to make serious musical instruments that reflect their culture and ethnic identity. 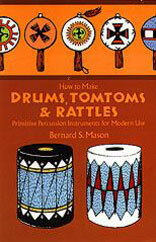 You find more detailed information and sample pages from Making Gourd Musical Instruments on our tour page.